Sunsets and Dublin - two of my very favorite things! Warning! This post might make you thirsty. I do love me some Irish pub. Of course I make the requisite visits inside when I can <ahem>, but most of the time I am shooting these from the exterior. But that's ok, as I find there is a lot of character among Irish pubs. 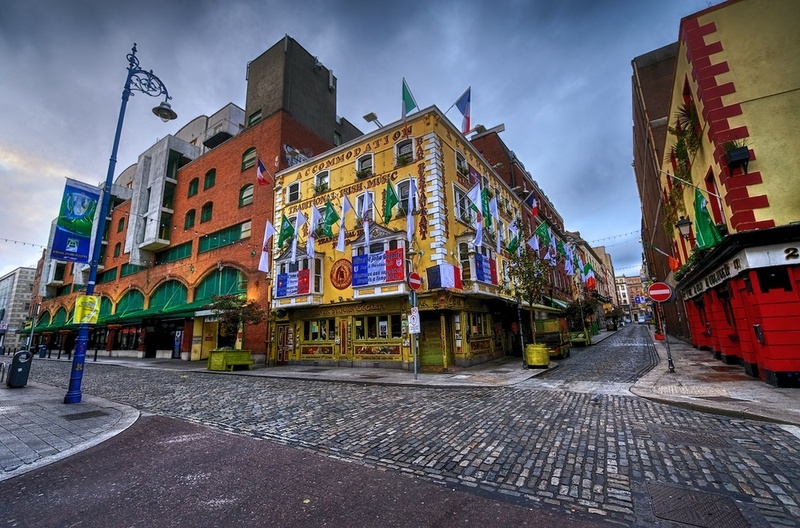 One of my favorites to shoot is the Oliver St. John Gogarty, which you see below. It's a short walk from The Temple Bar, which is the most famous (and most photographed, at least by me!) Irish pub in a town that's bursting with them. I love all those flags, and have shared many a photo of this place here in the past (and likely will do again). Isn't this a fun looking Irish pub? This next one is the Bison Bar, which from the outside is pretty easy to miss. So easy, in fact, that I have missed it many times though it is next door to my normal hotel there. But on my last visit we ended up there after some shooting (and while waiting for the light to change). I'm really glad we did! I thought this interior was really interesting. I loved this wooden interior, and that light reflecting across the floor. And lastly this is The Dame Tavern, which I have never been in (but there's always hope!). We were wandering around doing the photography thing and when I saw this scene with all the kegs stacked outside, I just really liked it...so here it is. Dublin is really a wonderful town which I immensely enjoy wandering in. I find there is a lot to aim the camera at, and there's always a pub to rehydrate and rest in. Good times! How do you beat the crowds? Get there early! That is sound advice when it comes to visiting the most popular pub in Dublin (or any pub in Dublin, for that matter!). If you want to beat the crowds, get there early. This is The Temple Bar, and this place fills up with tourists most nights of the week. As such it's sometimes hard to make your way to the bar for a pint of Guinness (and that's definitely the thing to do there, though there is also live music). But it's equally sound advice when you want to get some photos of the Temple Bar. Because of said crowds, you just cannot possibly get a clean shot of the place, except early in the morning. Let's face it - you know you can't possibly wait out the crowds in the evening. They are probably out there til all hours of the morning. I guess, technically, you could slap on a filter and do some really long exposure, with the result being that all the tourists blur out of the shot. But I'm not even sure that would work, because often there is a bouncer of sorts standing outside, just moving slightly left and right. He would just be a blurry mess. Besides, that's what caffeine is for. Get up early, shoot without the crowds, then go get some caffeine. It works great for me. But you can rest assured that by 6am or something like that, everyone is safely slumbering back at their hotel, which means you get to stand in front of what is arguably the most famous Irish pub in the world, and shoot to your hearts content. That's my kind of thing. I get pretty excited about taking these shots, every time I go to Dublin. And no, there are no tricks in these shots - no Photoshop "people removal" or anything like that. The streets were just empty, with a single person walking by every now and then. Otherwise, it was me and my camera (and my friend Mark, who was also shooting away). Well, there was a guy doing a little work around the outside of the Temple Bar, but I mostly just shot around him. That was easy. I have found a great little hotel (The Clarence Hotel), which most times has very reasonable rates and is just a 2 minute walk from here. It's perfect, in fact. It's a nicely appointed place, and let's face it, hotel choices often come down to location. Not to mention it's owned by Bono and The Edge of U2 fame, so there's that. No, I haven't seen them there yet - I once missed them by 2 days though, dangit! I've been a fan of them since I was a kid. Maybe someday I will bump into them there. Wouldn't that be awesome? It also has a great little bar, shaped like an octagon, and conveniently named The Octagon Bar. I've been there and chatted with the bartenders a couple of times, and like all the Irish I have met in my travels there, they like a good conversation. The head bartender (who sadly moved to Australia or something) was a "certified flair mixologist", which is another way or saying that he used to toss bottles around while mixing drinks, like in the old Tom Cruise movie Cocktail. It was incredibly entertaining. But anyways, I stay at The Clarence and at least one morning during my stay, I drag myself up and out before sunrise, so I can stand on these tourist-free cobblestone streets and fire away. It's so awesome when you have this to yourself. That's why I recommend sunrise shooting in cities. You can see all the awesome spots without the distraction of tourists. For those that are curious, these were all shot with my Nikon D700 and the wide angle lens - which I absolutely love - which is the 14-24mm. It gets nice and wide so I can gather up all the bits on both sides of the lane. I love that thing. Also, these photos were all adjusted in Color Efex Pro and Aperture (and the first 2 are single exposure shots, while the rest are all 7 frame HDRs). In Color Efex Pro, I normally use some of these filters: Detail Extractor, Pro Contrast, Brilliance/Warmth, Glamour Glow, and Skylight. Sorry but not sure which filters were used on which photos, though. I'm not organized enough to keep track of all that! I have so many shots of The Temple Bar, many of which I have shared here before, but even more that I just haven't processed and shared yet. I've been to Dublin 4 or 5 times now, and I tend to gather a lot of shots while I am there. So, hopefully you enjoy seeing Dublin pics, because this blog has a lot of them and more will be coming! Lastly, these were all shot on my most recent visit to Dublin, which was a few short weeks ago, although it already feels like a year ago. I love that town. Hopefully I will get back! Do you have certain things that you automatically associate with certain countries? You know, like tea with the English? I have a few, and one of them is good pubs and the Irish people...they just go together. I've posted many photos here of The Temple Bar pub in Dublin, and I admit that I still have PLENTY more of those to get to. It's just so photogenic. Frankly, I love that spot. But there's another pub in Dublin which is well worth your time. It's this one...The Brazen Head. It's awesome, and it's the oldest pub in Ireland! Now, it's a bit more of a walk than Temple Bar, but only by a few minutes. And it's not sitting in the center of the entertainment district bearing it's name (also like The Temple Bar). But it has personality, and as Jules said in Pulp Fiction...personality goes a long way. I went there on my recent trip to Dublin after shooting around with my friends Mike Murphy, who was up from London for a few days, and Mark, who was traveling with me from Texas. We ended up sitting there and making friends with a group of Irish folks who were seated near us. Either way, we had a great time and I highly recommend you visit The Brazen Head when you get to Dublin. You can thank me later! And by the way...this place is full of locals, so that's saying something. Though I love The Temple Bar, I admit it's full of tourists mostly, whereas places like the Brazen Head appeal to the locals. That's good enough for me. I've had this photo finished and sitting on my desktop for months now. Not sure why, but I keep passing it over in favor of posting something else. But I decided that sitting there and gathering virtual dust is no way for this photo to spend it's time - it wants to get out there and be seen! So, here ya go - a sunrise I caught one morning in the lovely town of Dublin, Ireland. I have a thing for shooting pubs! I guess I didn't realize it until my recent trip over to Dublin, but as I was going through my shots I realized that I have taken a LOT of photos of the various pubs there. I can't help it - I just find them interesting! They just seem to have so much character. This one is a good example. It's not special in any way, and I doubt anyone would call it beautiful. But, as I walked past and looked down the street both ways, I just liked the look of the scene. The red color just pops against the grey, rainy skies I had that day, and of course I just love that little arrow pointing down the street. Cool stuff. This is one impressive library! 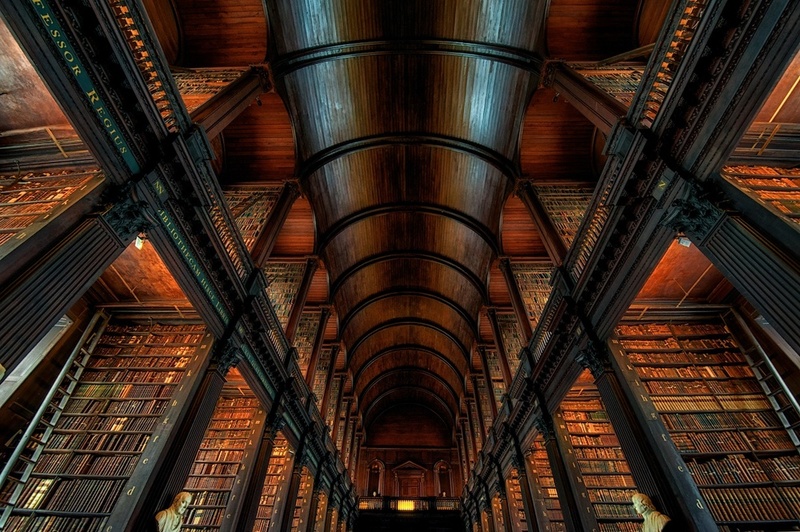 This library sits on the campus of Trinity College in Dublin, Ireland. I was in Dublin about a week ago, and prior to my visit I had a list of new places I wanted to go shoot there, and this was #1 on the list. Isn't it awesome? I have been to Dublin several times now, but for various reasons had never made it here to see this incredible library. I have seen photos online so I knew it was something worth visiting. I'm glad I had the time for it! It was somewhat busy, though not entirely crowded, but when I am in places like this I try and exclude the tourists from the shots if possible. In this case, I just aimed a little higher than normal. Regardless, I thought it gave a nice view of the place, and in case you are curious, no you cannot touch the books. Some of these things are really old. The Library also houses the famous Book of Kells, which dates from something like 800 AD. So yeah, some old stuff in this place. If you find yourself in Dublin, go and check this out! I finally got a good shot of this thing! I have been to Dublin several times now, and each time I have seen this wonderful building, standing so tall and interesting next to the River Liffey. But, each time I have not really loved the photo that I have ended up with. It's different reasons each time, but nonetheless I wasn't totally thrilled with any of them. And by the way, this is the Four Courts Building in Dublin, which is the seat of their Supreme Court, among other things. I just like the architecture, and the fact that it sits next to the river (and it's close to the oldest pub in Ireland, which is the subject of a post I hope to get to soon). But, this time was different. As I mentioned in yesterday's post, I just returned from a trip to Dublin (and then on to Glasgow) and was able to get in quite a few shots in both towns. 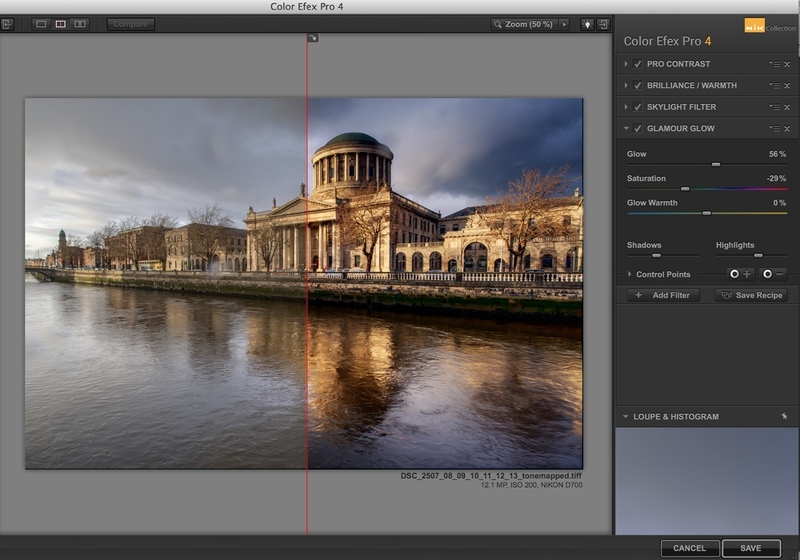 And despite the rain threatening in Dublin, I kept getting my shots in without too much incident, rain-wise. It just worked out. The great thing about rain (yes, I just said that!) is that rain comes via clouds, and clouds can add a lot of interest and drama to a shot. Take this photo, for instance. Although I like the shot a lot, I admit the sky adds a different (and more interesting) element to the shot. If there were no clouds in the sky and it was a clear blue, I would be pretty bored with it. I just got back from Dublin - love that town! I spent last week in Dublin and Glasgow, two cities that I really enjoy visiting. I always bring my camera (of course) and take photos, time-permitting. Well, time did permit and I clicked away like crazy. But, I actually didn't take today's shots last week - I took these on one of my previous trips there. I just happened to have them ready, and when I sat down to write this, all I could think about was Dublin! I just haven't had time to work on any shots from the trip yet - hopefully I will get to that this week sometime. I took over 1500 shots in the two cities last week, so I expect I will have some real goodies to share with you. Plus, I also got to several new spots in each town, which means I can add them to my lists of where to shoot in each city - fun! So, til I get to processing the new stuff, please enjoy these which are of The Temple Bar in Dublin, taken in broad daylight (of all things!). I just happened to be walking by one day, and it only took a couple of minutes for the scene to clear out, and then I fired away. The Temple Bar is just so photogenic - I shoot it every time I go there. I just can't help myself! I hope you don't mind seeing it again. And if you do, well...sorry, but there are a million more shots of Temple Bar that I haven't even processed yet. And believe me, I definitely plan to share them here when they are ready! Ok, I know I say that a lot here but man is it ever true! See this scene? I have walked by here at all times of day: blue hour in the morning and on thru sunrise, mid-morning, mid-day, sunset, and into the evening. Guess what? It's freaking crowded almost all the time! You know why it's crowded? It's awesome. 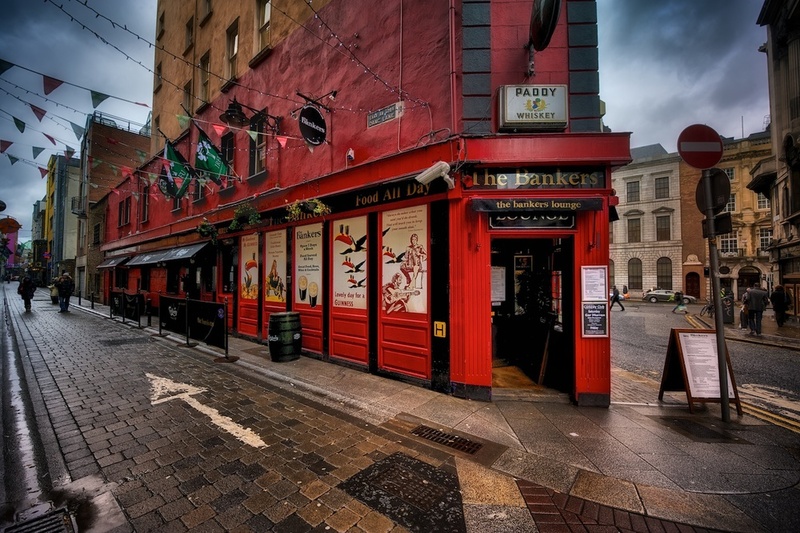 Ok, well the other reason is that this is in the middle of Dublin's entertainment district which is known as Temple Bar. That's where all the tourists go to have fun. Except at sunrise of course, because all the tourists are still asleep. So that brings me back around to why I love sunrise. I get to stand on a street corner in the most famous part of a famous town, and shoot at anything and everything I want, and not have anyone get in my way. Who can argue with that?